Whilst I was at university, I built up a fairly expensive indie magazine habit which set me back a rather too large portion of my living money - put it this way, it's lucky that my favourites weren't weeklies, or even monthlies. It's nice to sit down with media which isn't online, and which isn't the free newspapers from the tube. People have put time and effort into writing good stories, making great photographs, and putting it all together in a format which won't see its content outdated in three days time, or probably even in three years time. Taking things slowly. Another Escape has become one of my favourites of the bunch. It's something I always keep an eye out for whenever I'm near a good newsagents, and can count on to be worth the £10 price tag. I'm still hunting down Volume 1 for myself, which is perpetually sold out! 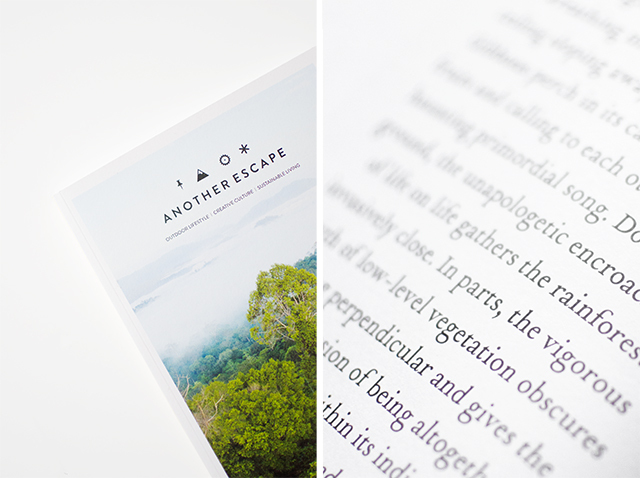 The magazine focuses on the outdoors, sustainability and creativity - an amazingly rich and diverse topic base. I've read about Borneo's ecosystems, heritage wool production in Yorkshire, North American hiking trails, how electric light has impacted creativity, Inuit kayak makers and the history of pigments. Opening it up is always a joy and a surprise, and I've learnt about all kinds of things I'd probably never stumble across in my day to day life. It's not just the writing, though; the photography and design are beautiful too, down to the paper quality and vegetable inks used for print.